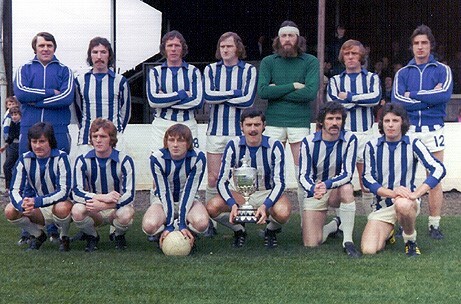 Coleraine began the 1974/75 season as Irish League champions, the crowning achievement of Bertie Peacock’s 13 years in charge, but now were faced with the task of replacing their longest-serving and most successful manager. Aiming to maintain continuity with Peacock’s regime, the board opted against bringing in someone fro m outside the club and instead handed the reins to two of the most experienced players in the squad, Johnny McCurdy and Ivan Murray. But before their first season had even started the club was hit by tragedy. Sean Mullan, younger brother of former Coleraine forward Brendan, and a very promising player who had been an important part of the title-winning squad, died suddenly during a training session at The Showgrounds. He was only 21. The new player/managers rallied the squad well and only lost one of their first eight games in charge before heading into the club’s first European Cup campaign. The draw handed them a return to Rotterdam where they would face Feyenoord, the Dutch champions who had within their ranks seven of the Netherlands’ 1974 World Cup squad and had won the European Cup four years previously. 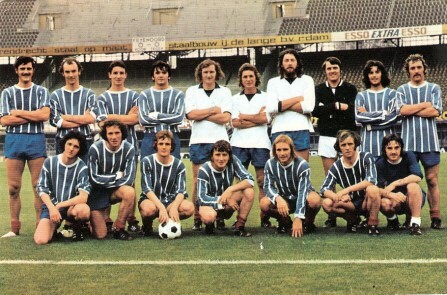 Not entirely unexpectedly, Coleraine were handed a footballing lesson by the Dutch masters in the imposing De Kuip stadium, losing 7-0, still their record European defeat. It was a similar story in the home leg, although at least this time they managed a goal, Alan Simpson’s consolation goal in a 4-1 defeat, making him the first Coleraine player to score in Europe’s premier club competition. A loss of domestic form around the European ties hampered their chances of success in the first half of the campaign and it did seem very much like Coleraine were a team in transition, as a number of players moved on. Tony Curley had played his last game in the title-winning season and in January 1975, Alan Campbell left to take up the post of player/manager at Glenavon. To replace him, McCurdy and Murray brought in their fellow Ballymoney man Liam Beckett back north after a spell at Drogheda United. Eddie Crossan, who had been the regular goalkeeper for several seasons, also lost his place to his understudy Vincent Magee. Coleraine would eventually come up short in the defence of their title, finishing in second place, albeit five points behind Linfield. However, the Irish Cup would be a different story. It was gruelling cup run, with Coleraine eventually playing eight games in the competition. Crusaders were beaten after a replay in the first round, two goals from Terry Cochrane and a penalty from Murray sending Coleraine through 3-1 at The Showgrounds. It was a similar story in round two; Coleraine drew 1-1 away to Cliftonville, but then proved too strong in the replay, winning 5-0 this time. Brian Jennings and Des Dickson both scored twice, Cochrane added the other. They had a slightly easier passage through the semi-finals against B Division side Brantwood at Solitude. Brantwood had stunned Glentoran in the previous round, but Murray scored twice, with further goals coming from Dickson, Jennings, Davy Jackson and Peter Tweed as Coleraine won 6-0 to set up a final showdown with Linfield. The eagerly anticipated final was shrouded in controversy before a ball was kicked. First up, four Coleraine players (Des Dickson, Terry Cochrane, Eugene McNutt and Lee Clarke) were ruled out of the final on April 19 through suspension. Then Linfield threatened to withdraw from the final in protest at the Ballymena Showgrounds being named as the venue. In the event, the game went ahead, although Linfield fans organised a boycott and didn’t take their full allocation of tickets. The game itself ended 1-1, former Derry City striker Jim ‘Chang’ Smith put Coleraine in front, but Davy Graham levelled for the Blues and forced a midweek replay. Cochrane and McNutt returned from their bans but couldn’t help Coleraine break the deadlock. Their best chance fell to Ivan Murray from the penalty spot, but after a run of 17 successful spot kicks, he was foiled by Blues ‘keeper Ken Barclay. The third game was a bad-tempered affair, Coleraine’s Davy Gordon and Linfield’s Eric Magee and Alan Fraser were sent off, but Coleraine did just enough the see off the Blues at the third attempt. Dickson returned from suspension for the second replay and his cross was headed in by Smith to clinch the cup. Crowning off another successful season was Murray’s second successive Player of the Year award from the NI Football Writers, the only man to win the award in successive years. McCurdy stepped down from his management role at the end of the season although he remained in the playing squad, leaving Murray to carry on alone as manager. 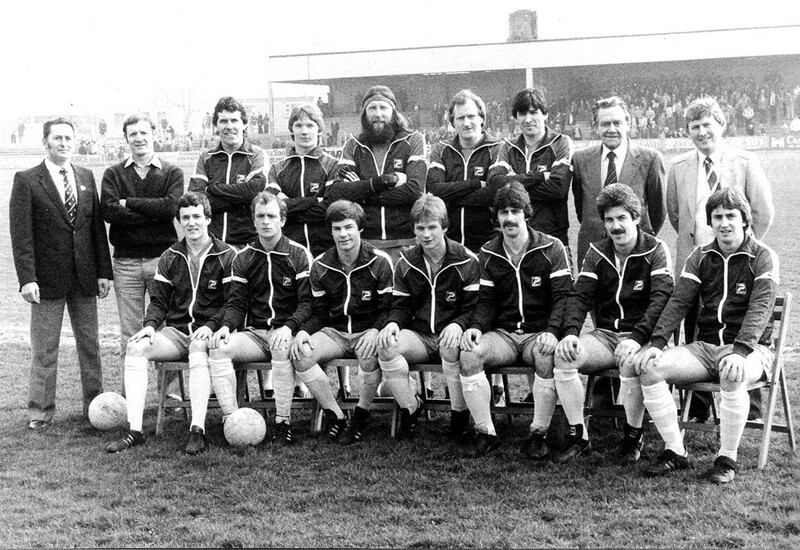 But it had no effect on the team’s performances as 1975/76 began, as they carried their momentum from their Irish Cup win into the new campaign. They were unbeaten in the Ulster Cup, scoring 32 goals in 11 games, including 6-0 wins over Portadown and Crusaders, wrapping up the trophy with a 1-0 win over Linfield at Windsor Park. Unlike the previous season, heavy home and away defeats in Europe, this time to West German side Eintracht Frankfurt, didn’t disrupt their domestic form and they continued to push on for glory, winning the Gold Cup final 2-1 against Ballymena and reaching the City Cup final. With a 35 game unbeaten run in domestic competition behind them, Coleraine headed to Seaview for the City Cup showpiece against Bangor looking to pick up a fourth piece of silverware in little over eight months. But with the game ending deadlocked at 0-0, Coleraine lost out on penalties. 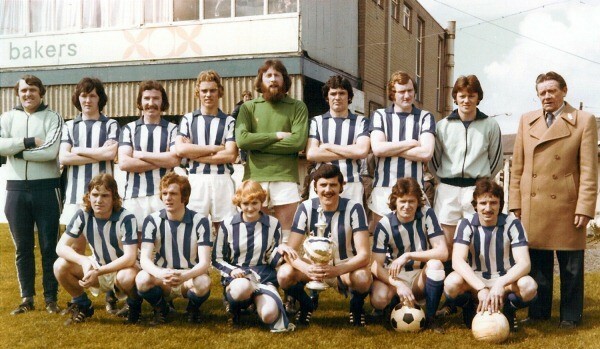 There was to be no further silverware that season, as Coleraine ended up third in the league, five points behind eventual champions Crusaders, although they could have taken second spot and qualified for Europe with a win at The Oval on the final day. Despite two goals from Dickson, the game finished 2-2 and Coleraine missed out. Their defence of the Irish Cup had come to a premature end, beaten in a second replay by B Division Carrick Rangers, who would go on to cause one of the biggest shocks in Irish Cup history by beating Linfield in the final that season. 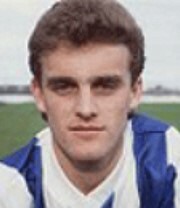 The following season began with transfer speculation surrounding Terry Cochrane, who had broken into the Northern Ireland squad and was now being sought after by Burnley. While the wrangling over the fee which would take Cochrane to England was going on, Coleraine relinquished their grip on the Ulster Cup. Cochrane played his last game as a substitute in a home win over Distillery at the start of October before being transferred for a fee which would ultimately rise to £250,000, a club record to this day. Meanwhile, three defeats in five games saw Coleraine out of the Gold Cup, while another inconsistent league campaign saw them wind up fourth, nine points behind champions Glentoran. 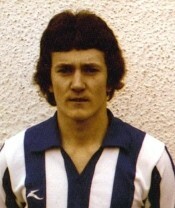 Young defender Tommy Connell had an impressive breakthrough season, but 1977 marked the end of Johnny McCurdy’s Coleraine career, the veteran former manager and captain playing for the final time in a 0-0 draw against Cliftonville in February. While they came up short in the league, the Irish Cup once again proved to be the saviour of Coleraine’s season. They kicked off with a 5-2 win over Carrick in the first round, two goals apiece from Dickson and Michael Guy and one from Frankie Moffatt sealed revenge for the previous season’s elimination. Guy scored the only goal to beat Crusaders at Seaview in the second round and after a 0-0 draw in the original game, Moffatt, Connell and Dickson scored to see off Distillery 3-0 in the semi-final replay and book another final against Linfield. Coleraine went in front at The Oval through Liam Beckett but after Jim Lemon levelled for the Blues, were forced to withstand a lot of pressure, with ‘keeper Vincent Magee in excellent form as he repulsed shot after shot. Then on 74 minutes, a moment of Dickson brilliance changed the game. He pulled the ball inside Peter Rafferty and hit the ball sweetly past Barclay with his right foot. Then within a minute it was 3-1, Moffatt giving Coleraine a comfortable cushion before Guy completed the scoring in the last minute to give Coleraine their biggest ever cup final win. The following season started promisingly enough as Coleraine put in another creditable display in Europe. Despite losing the home leg of their Cup Winners’ Cup tie 4-1 to East Germany’s Lokomotiv Leipzig, Coleraine produced a superb performance in the return game. 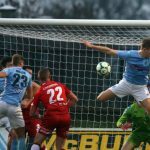 After going 2-0 down, they rallied and stunned their hosts with two goals from Michael Guy earning them their first draw on the continent and a standing ovation from the partisan home crowd. On the domestic front, Coleraine were runners-up to Linfield in the Ulster Cup and during a match against Larne in that competition, Vincent Magee had the distinction of becoming the first Coleraine goalkeeper to score a goal in a competitive game when one of his trademark long clearances caught out his opposite number, who was distracted by the presence of Des Dickson. But things took a turn for the worse in the second half of the league season. Having picked up 16 points at the halfway stage, Coleraine only won a further three points from their last 11 games and finished eighth, their worst league showing in 15 years. Matters weren’t helped by the departure of Davy Jackson to Ballymena and Michael Guy to Sheffield United and at the end of the season, Murray himself was gone, sacked as a result of the poor second half to the season. Into the manager’s chair now came another club legend, Victor Hunter, who had served as Murray’s assistant during his final season. 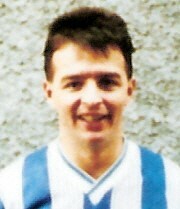 But the on-field problems continued as Coleraine again finished eighth in the table at the end of his first season. Some superstitious supporters blamed the team’s new playing kit, which saw the return of blue and white hoops for the first time since the early 1960’s, but the club’s problems ran deeper than the style of shirts being worn. Like Murray, Hunter had to deal with a team weakened by the loss of so many of the stalwarts of the previous two decades and early in the 1978/79 season, two of their top young players, Tommy Connell and Philip McCandless signed for Manchester United. 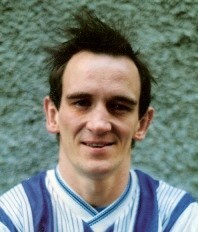 During the course of the season Hunter signed winger Kevin Mahon and gave a number of young players, including full back Ronnie McDowell their debuts. His rebuilding continued the following season with McCandless returning after only a year at Old Trafford. Then in time for the start of the league campaign, Hunter brought forward John Platt back to his home town club from Cliftonville. Platt worked in Coleraine as a schoolteacher, while his brother Davy already was on the club’s books. Their father, Howard Platt had also played for the club in the 1940’s. John scored 13 goals in 22 appearances before surprisingly returning to Solitude before the season’s end. Coleraine still relied heavily upon Des Dickson for goals, the Ballymoney man was now approaching veteran status, but still top scored with 30 goals in all competitions. However, a lack of goals from elsewhere in the team meant that Coleraine could only finish seventh, while chances of Irish Cup glory were ended by a shock defeat to the RUC team in the second round. 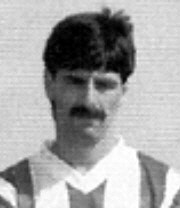 The summer of 1980 saw Hunter make one of his best signings for Coleraine, in securing Londonderry-based midfielder Felix Healy after he returned home from a spell with Port Vale. Healy swiftly made himself an indispensible part of the team, but again it was a troubled season for Coleraine. They found themselves without ‘keeper Vincent Magee for most of the season after he broke his leg in a game at Ballymena, while Kevin Mahon was sidelined for three months with a broken jaw sustained in a game against Cliftonville. Two of the heroes of the 1977 Cup final win departed the club as Frankie Moffatt joined Cliftonville, while Liam Beckett was released. Coleraine finished another disappointing season in ninth, their worst run of league finishes since the days before Bertie Peacock. A miserable campaign was compounded by a first round Irish Cup exit to Ballymena United. Hunter’s position as manager was the subject of much speculation throughout the latter half of the season and he announced his decision to quit in April, with one year of his contract still remaining. The players did ensure he departed with some silverware, a youthful side beating Tobermore United to win the North West Cup. Once again the club didn’t look far for a successor, with the board appointing Des Dickson as player/manager, with another club stalwart Tony Curley coming in as his assistant. The new regime got off to a very promising start, with Coleraine mounting a real challenge for the Ulster Cup. The 11-game competition went down to the final game, with Coleraine travelling to The Oval knowing that a win was necessary if they were to clinch the trophy. Unfortunately, Glentoran proved too strong on the day and ran out 3-0 winners. But they continued their good form once the league campaign got underway and put themselves in serious title contention with a string of good results in January, including a 3-1 home win over Linfield and a great 2-2 draw at The Oval, with player/manager Dickson netting twice. While Dickson continued to roll back the years, Felix Healy was in imperious form, netting 26 goals in all competitions (second only to the manager’s 27) and attracted the attention of Northern Ireland manager Billy Bingham, who in early 1982 was finalising his plans for the World Cup in Spain that summer. Ultimately Coleraine couldn’t keep pace with Linfield in the league, finishing third behind them and Glentoran after losing their final three games, but by that time attentions had already switched to another Irish Cup final. The first round had seen Coleraine edge past Londonderry outfit Institute 2-1, thanks to a brace from Kevin Mahon before winning another North West derby in the second round, 2-0 against Limavady United with goals from Healy and Pat Mullan. Dickson struck the only goal in the semi-final win over Cliftonville to set up another showdown with Linfield, who were looking to complete the league and cup double. A marvellous goal from Healy early in the second half gave Coleraine the lead and for a long time it looked like Coleraine had done enough to win the game and continue their run of cup final success over the Blues. But two late goals, from Lindsay McKeown and a penalty from Billy Murray turned the game on its head and ensured the silverware went back to Windsor Park. 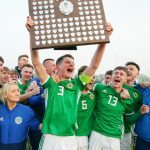 Nonetheless, Coleraine could be proud of their performance over the previous season, Healy in particular who was crowned Player of the Year by the Football Writers and was called up to the Northern Ireland squad for the World Cup. It was to be a memorable tournament, with Northern Ireland again exceeding all expectations and Healy’s substitute appearance against Honduras made him the first Irish League player to play in a World Cup. Another Coleraine man was involved in the success as Bertie Peacock travelled to Spain as an advisor to Bingham. 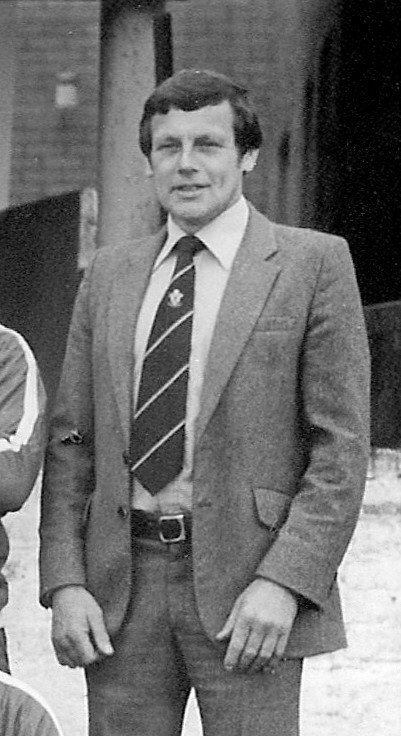 Dickson lifted what would turn out to be his only trophy as manager at the start of the following season, defeating Moyola Park to win the North West Cup, but it was Coleraine’s return to Europe which captured the imagination in autumn 1982. As Linfield had won the league and cup double Coleraine, were entered into the Cup Winners’ Cup and were handed a plum draw against Tottenham Hotspur. 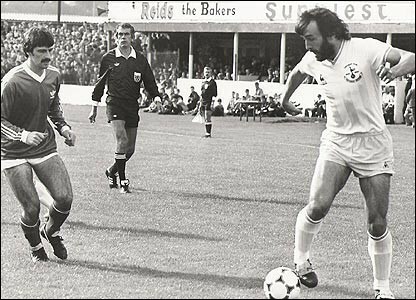 A record crowd packed into The Showgrounds on September 15 to see Coleraine take on the English FA Cup winners, who included in their squad the likes of Ricky Villa, Garth Crooks, Glenn Hoddle and Ray Clemence. The star-studded visitors ran out 3-0 winners and won the return 4-0 at White Hart Lane, but Coleraine were not disgraced and did very well financially out of the tie. Not long after the Spurs ties, Des Dickson brought the curtain down on his playing career finishing on a total of 452 goals in 609 games. He won every honour the local game had to offer and finished top goalscorer five times in all. He also won four Northern Ireland caps in the early 1970’s. As one illustrious career came to an end, others were just beginning. Cookstown-based youngster Ray McCoy had made his debut towards the end of the previous campaign, but started the new season in fine form, eventually playing 40 games and scoring 24 goals. Ricky Wade, a nephew of Ivan Murray and a prolific scorer in the reserves also began to stake his claim for a first team spot. 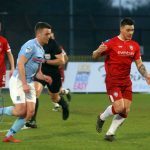 Dickson had also added tough-tackling Roy McCreadie during the summer, while on New Year’s Day, the versatile Marty Tabb made his debut in a win at Ards. Coleraine again took the fight for the Ulster Cup down to a final game showdown against Glentoran, although they needed a four goal win at The Showgrounds to take the trophy but lost 3-1. However, they made an inconsistent start to the league and after a 2-1 defeat by Linfield on January 8, Dickson resigned as manager. Assistant manager Tony Curley stepped into the breach and got his reign off to a storming start with a 5-0 win over Crusaders. Gerry O’Kane and Kevin Mahon scored the first two goals, but the real star of the show was McCoy, who scored a hat-trick. Then after a 1-1 draw away to B Division Omagh Town in the Irish Cup, Coleraine romped to a record victory in the replay, Gerry O’Kane scored four, Pat Mullan two and Tony Bell and McCoy one apiece in an 8-0 win, the club’s biggest ever in a cup match. Glentoran ended Coleraine’s interest in the cup in the third round, but with good form in the league, a return to Europe in the UEFA Cup was not out of the question. After a defeat by Distillery at the end of January, Coleraine went through the second half of the league campaign unbeaten and clinched third spot with a 3-1 win at Seaview through goals from Mahon, Mullan and Wade. The 1983/84 season saw the Irish League increased to 14 teams for the first time since before the Second World War with the addition of Newry Town and Carrick Rangers and this meant that the Ulster Cup joined the Gold Cup as a round-robin format, followed by knockout semi-finals and a final. Coleraine did relatively well in both competitions, reaching the semi-finals of the Gold Cup before losing to Linfield and going all the way to the Ulster Cup final before losing a high-scoring affair 5-2 to Glentoran. Coleraine’s European exploits were once again brief, but the draw afforded them an opportunity to renew old acquaintances with Sparta Rotterdam, who they had faced in the 1970 Fairs Cup campaign, when manager Curley had been a player with the club. After losing 4-0 in the Netherlands, Felix Healy’s goal salvaged some pride in a 1-1 draw at home. Ultimately the season would end with Coleraine having nothing to show for their efforts. A first round exit in the Irish Cup and a fifth place finish in the league meant there wouldn’t even be a return to European competition. By now the side consisted of a good blend of youth and experience, with the likes of McCoy, Wade and Ronnie McDowell now firmly established as top performers and a young Michael O’Neill starting to make an impact in the first team, backed up by veterans like Vincent Magee, Eugene McNutt and Tony Hutton, with the mercurial Healy pulling the strings in midfield. Up and coming players in the Coleraine squad of the mid-1980’s (L to R) Ronnie McDowell, Ray McCoy, Ricky Wade, Marty Tabb. While the future looked bright for Coleraine, a new man would be required to lead them into it. Curley had always made it clear he didn’t want the manager’s job long-term and announced his decision to step down at the end of the season, although he remained with the club as part of the backroom staff, taking up the role of scout.